A day will come when, according to the biblical expression, our world will be closed like a book. This will be the day of God, the day of His justice, of His triumph. God must have the last word to show that He is the all-powerful Master, the sovereign judge. It is also necessary that in the face of the universe, virtue is rewarded, vice is punished and humiliated! Saint Michael will have a grand role to fill in the events which will be accomplished then. In a brilliant way, he will appear as the soldier of God, the avenger of his rights. But having placed a foot on the earth and the other in the sea, he will cry that there is no more time, and he will have to fight a great fight. When will approach the end of the world, the man of sin will attempt a supreme effort against God and His Christ. Michael, the champion of the rights of God of Heaven, will rise again, and will defend the servants of Christ, overthrowing the seducer from his throne and kill him. This is the teaching of the of the doctors. They teach us, by the witness of Saint Gregory, that the Archangel Saint Michael will be the celestial envoy who will kill the Anti-Christ. It is written, it’s true, that the Lord Jesus will kill the Anti-Christ by a breath of His mouth; but the commentators understood by these words a command given by the Christ to His Archangel: Saint Michael will act as His minister, as a ray of His glory. Then will sound the solemn hour, the last hour. Next all the inhabitants of the earth must appear before the Eternal One. 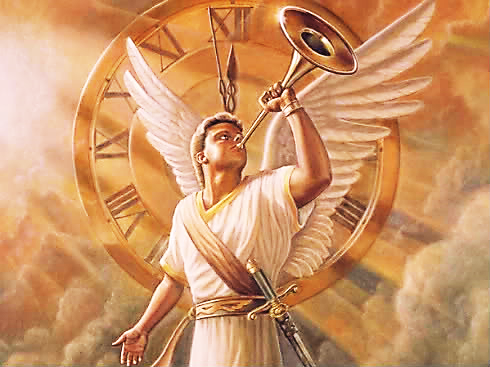 At the voice of the Archangel, at the resounding call of the trumpet, a mighty life will flow in the bowels of the upset ground and at the last sound of the angelic instrument, in an instant, in the twinkling of an eye, the men will come out of their graves. The cross of Jesus Christ, in the valiant hands of Saint Michael, the standard bearer, will hit their frightened eyes. Then, like the lightning that shines in the west and illuminates to the east, the Christ will appear majestically in the midst of a shining cloud of celestial spirits. All men will be there, assembled by the angels: the wicked seized with terror, aghast in inexpressible anguish; the good ones filled with an indelible hope and raised by love, throwing themselves into the air at the coming of the Savior. The angels will make the preparatory separation for judgment and the discussion will open. The sentence will be pronounced, the angels will fly to its execution. Taking the head of the brilliant cortege, Saint Michael will lead the Elect to Paradise and will present them before the throne of God. Then thundering like lightning, he will hurl the damned into the abyss of fire, and bury the gates forever. Such will be the prelude to eternity. The Church calls this the Day of Judgement. Happy they who, while they live, have asked Saint Michael’s help and protection for they will not perish in the day of terror. Practice: The sentence which is laid upon us on the last day will be such as we shall have prepared it during our lifetime; God will only ratify our choice: it's up to us to choose.